Aerospace Coatings Market size was worth over USD 680 million in 2016 and the demand is estimated to cross 16 kilo tons by 2024 at 5.4% CAGR from 2017 to 2024. Positive outlook for aviation industry driven by increasing demand of commercial, military and general aviation will fuel aerospace coatings market share. Upsurge in air traffic globally, especially in emerging economies has resulted in airlines commercial fleet size expansion. Rising disposable income in emerging countries coupled with boost in global economy is increasing passenger’s preference for air travel. In 2017, world economy increased by more than 2.5% and global air traffic increase by 4.5% compared to 2016. Commercial fleet expansion drives the associated industries, thereby escalating aerospace coatings market demand over the forecast timeframe. Manufacturers are investing in R&D to develop cost effective performance products which in turn will support aerospace coating market growth during forecast period. For instance, in February 2016, PPG invested USD 7.8 million in its coating innovation centre. Technological advancements such as nano technology will support the aerospace coatings market growth. The technology prevents corrosion of metals used in aircrafts. Metals such as magnesium are highly prone to corrosion due to high chemical reactivity. Materials developed from this technology increase the metal durability in the aircraft, establishing an important role in aerospace coating market. In 2016, epoxy resin demand was over5 kilo tons in aerospace coatings market. The demand is attributed to its application in commercial and military aircrafts. Polyurethane resins will exhibit highest growth rate owing to its advantages such as high resistance to staining, abrasion and chemicals. The resin provides excellent wet look and adhesion to substrates at relatively affordable cost. Regulations related to chrome free inhibitors and volatile organic compound reduction (VOC) supports the demand for polyurethane in defence industry. Solvent based coatings were valued over USD 400 million in 2016. The segment market size can be credited to its superior performance in terms of better coverage, smooth surface finish and corrosion resistance. Water based solvent will exhibit highest growth stimulated by its environment friendly nature, uniform finish and better coverage. Powder coating’s growth is fuelled by its demand in decorative applications. OEM is leading the overall aerospace coating market and is expected to maintain its dominance during forecast period. High aircraft build rates and increasing backlogs for major aircraft manufacturers such as Airbus and Boeing will stimulate the demand from OEM sector. Demand from maintenance, repair and overhaul (MRO) will experience highest growth rate owing to consolidation of aviation industry. Mergers & Acquisitions in aviation industry generate new logos demand thereby fuelling demand for repainting of aircraft. 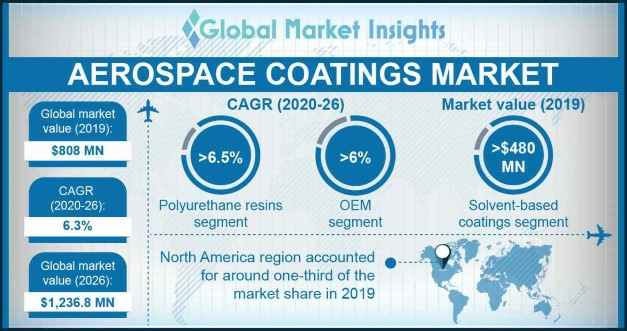 Additionally, faster processing time, wide colour options and cost-effective services will support the aerospace coating market demand from MRO during forecast period. Product demand from commercial aircraft acquires maximum share followed by military aircrafts. Increasing passenger’s affordability for air travel and frequent business trips of middle and high-class managers stimulates the demand in commercial segment. Need to travel overseas for business trips, time saved in air travelling and delightful airlines services will support the growth of commercial aerospace coatings market segment during forecast period. Military aircraft was valued at over USD 240 million in 2016. The growth is credited to increasing defence spending to upgrade the aircraft and demand for high performance products to sustain against explosive conditions during fight. Demand from exterior application in aerospace coatings market crossed 9 kilo tones in 2016. The growth is supported by need for substrate to handle extreme weather conditions and exposure to light. Companies manufacturing high quality exterior coatings for improved durability, long colour & gloss retention, faster dry time and lower weight will fuel the demand for exterior applications during the forecast timeframe. Growth of interior applications is attributed to frequent repair & maintenance cycle for better appearance and decorative aspects. North America aerospace coatings market size crossed 3 kilo tones in 2016. Presence of key aircraft manufacturers coupled with new aircraft advancements such as 787 & 737 MAX by Boeing and A350 & A320neo by Airbus will support the industry growth. Asia Pacific will exhibit highest CAGR with high demand coming from China, India, Vietnam, Singapore and South Korea. Singapore and Malaysia are the major countries providing MRO services to regional and international airlines. Increasing commercial aircraft demand and aircraft producer’s establishing manufacturing facilities in the region will stimulate aerospace coatings market share from 2017 to 2024. Middle East and Africa accounts for prominent share in aerospace coatings market due to rising number or air travellers in UAE, Saudi Arabia and other Middle East Countries. Additionally, focus on defence spending for capacity expansion and fleet upgradation will fuel the product demand across the region. Major players in the industry are Akzo Nobel NV, BASF, Mankiewicz, Argosy International, Heinkel, PPG Industries, Merck Performance Materials, IHI, International Aerospace Coatings Holdings, Asahi and Brycoat. 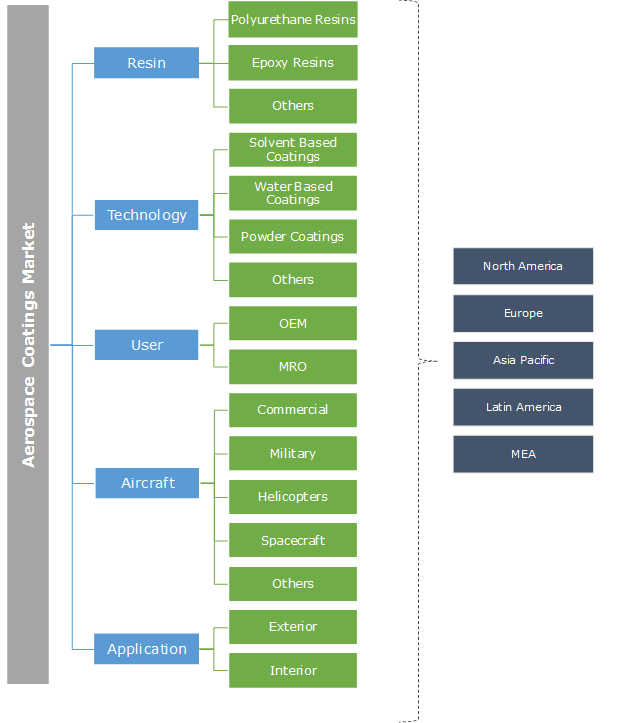 Industry is consolidated with few companies acquiring nearly 50% of the total aerospace coatings market share. Airline mergers and acquisitions provide growth opportunity for manufacturers as airlines repaint their fleets due to change in brand and identity. Increasing demand due to expanding aviation sector and customer preference for quality products is projected to boost the aerospace coatings market rivalry. Competition is intense as customer requirements, regular innovation and development of performance products is crucial for business growth and maintaining the position in global industry. Manufacturers focus on reducing cost, faster cycle time, reduction of waste and improved efficiency to increase their production. Aerospace coating is a protective covering applied on the aircraft surface for decorative and functional aspects. It is also called as a substrate. Airlines use decorative coating for painting, repair and maintenance whereas protective layer is used to prevent parts from external reaction and also prevents chemical reaction with other parts. Some of the important characteristics for protective layers are protection against intense UV exposure at high altitude, protection against temperature fluctuation, corrosion and humid conditions. Demand to reduce downtime of aircraft, improved durability and extended maintenance cycle has stimulated aerospace coating market globally.